Russell Pinkston is a composer, teacher, and sound designer who currently lives in Austin, Texas. He has composed music in a wide variety of styles and genres, from choral, chamber, and symphonic works, to electronic music for modern dance. In recent years, he has specialized in writing interactive compositions for acoustic instruments and electronic sounds, and he has developed a number of software tools for real-time audio processing and score following. Since 1983, he has been on the faculty of The University of Texas at Austin, where is Professor of Composition and Director of Electronic Music Studios. 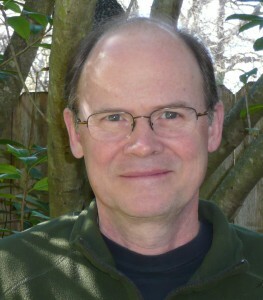 He is also a founding member and past president of the Society for Electro-Acoustic Music in the United States (SEAMUS). In a former life, he was the lead guitarist, singer, and principal songwriter for Tracks, a progressive rock band that played throughout New England from 1969 to 1974.